We’re at the beginning of the book by James Van Praagh: “Adventures of the Soul”! 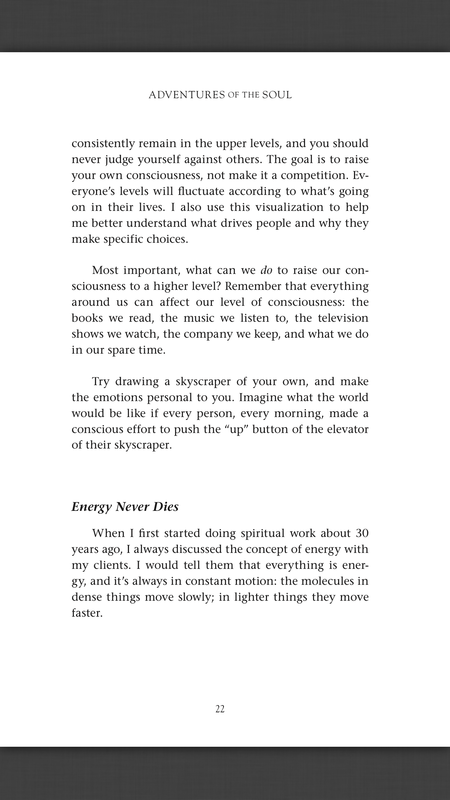 still, where he’s discussing what consciousness is, and how to raise our levels each day. Get a FREE copy of James book! James talks of mindfulness, of being honest with ourselves in feeling what our current level is and he gives an exercise, which he himself uses daily to work on elevating his own levels of consciousness. He has drawn a picture of a skyscraper with multiple floors, each floor represents an emotion. As we rise in the building, we reach higher and higher emotional levels until we reach the top floor, which represents love. The bottom level in his building is Fear. Then moving up he has Guilt, Pity, Acceptance, Service, Joy, Peace and then Love. I noticed he doesn’t have Anger, Resentment, Depression or Frustation. Those are some of the emotions I’ve dealt with, when my levels of Divine Love and Acceptance plummeted. When I look back on my life I see I had much higher levels of Love. Admittedly the love was more outwardly focused on other people, with much less towards myself. In the last few years when I was writing How to Heal Your Life on a Deep Heart Level, I had been working very hard to bring the love towards myself into balance with the Love I felt and expressed outwardly to others. I had reached a place of acceptance of myself, which helped me feel Joy, Peace and Love both towards myself and towards others. Being without an income for a year and a half while I helped my daughter with a difficult work situation, where she had accepted a job an hour and a half away and needed to leave the house at dawn and come home almost at the kid’s bedtime, meant that I stood in that gap to help her with the kids. Not having a job and my book sales were sluggish deeply affected my sense of self worth. I had started to have extreme doubts about my life’s mission. When we are in a place such as this, we need something outside of ourselves to help us. I didn’t want to go to the doctor for antidepressants which would treat the symptoms but not help me with the cause. I’m a great advocate of digging deeper and getting to the root cause. In my situation it’s not a clinical depression, not a chemical imbalance, but rather an outlook imbalance. This book, Adventures of the Soul, has quickly helped me to reconnect to what I lived before, but had forgotten temporarily, because of circumstances. It’s very difficult for us to maintain those higher emotional levels on a consistent basis, daily, hourly. We all can fall prey to the negativity around us, which in turn affects our inner dialogue in our minds! As he says, raising our level of consciousness through the emotions we feel isn’t a competition! We aren’t BETTER than anyone else who struggles with difficult and negative emotions. Each of us can fluctuate between higher and lower levels throughout a day or week, depending on what’s going on in our lives. I have always struggled with my self worth. I put a lot of work into myself to learn, grow and heal from my past. I think I hoped that once I reached a certain level of healing and was able to consciously direct my emotions into higher levels, that I wouldn’t be blindsided by negative thoughts and get down on myself anymore. When it happened I was shocked! What? I should know better! I have the tools, why didn’t I use them? I berated myself all the more. I judged myself harshly. I was getting into some pretty stinking thinking! By reading this book, not only has it helped me to reconnect with my purpose and higher self, but it’s helping me to look honestly at myself and how my feelings of self worth have been connected to my earning power on a much deeper level than I had ever realized before. We’re all human, going through a physical existence as spirit beings. We’re all going to stumble. We may fall. However, we don’t need to stay down! We can get up! If it’s hard to get up, we need to hold out a hand, so the universe can send us the help we need. For some people the universe will send others directly to help, guide, support or encourage. For others, we get sent books! I got sent this book by Hay House Publishing! I’m grateful to the universe for sending me this awesome help! I feel I can trust the author, since he is a spirit medium who, I feel, has received “special insider knowledge”! His words seem to resonate deeply within me! I’ll continue to share my “Aha” moments with you as I read further into this book! Next Loving Ourselves… means we don’t always put ourselves LAST! During lunch, I usually set some time out to read or watch something while I eat. 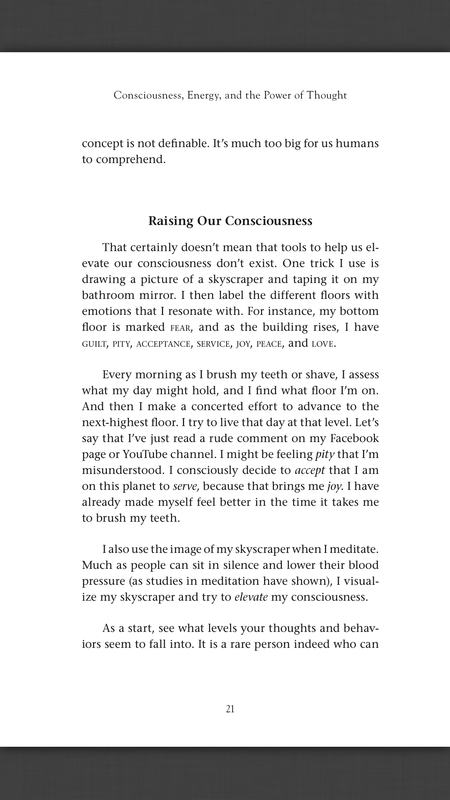 I don’t poke at things really, I’m generally led through a consciousness meditation technique. I didn’t find anything on YouTube so I started down the reader. I’ve pretty much spent the whole time on your posts. Positive indeed! Wow! That’s so awesome! Thank you for letting me know! That’s my goal: to be positive! I try to find the positive lesson in everything, even if it means digging a little! 😊 thanks so much!! I always appreciate your comments! !